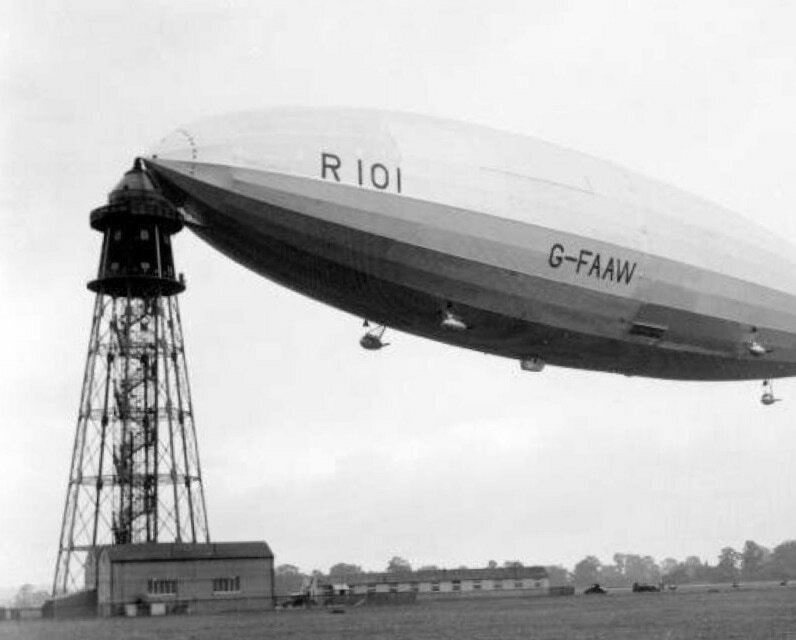 The R101 sadly crashed on the 05th of October 1930, although the crash in its own right would have written off the ship it's not what killed most of the crew, what killed the victims of the R101 disaster was the fact that directly after the impact the Hydrogen gas ignited. But what caused the fire? There is a popular theory that the fire was started in the gondola, the small control car at the bottom of the ship, it is said that there were Calcium Flares stored there that, when in contact with water would self ignite, these were used for navigating and working out wind drift by dropping them into the sea as they crossed the Chanel. Where would the water have came from to ignite them? It is said in the Book Airships-Cardington that pipes that were used to remotely control the water ballast system ran through the control car, the theory goes that on the impact the pipes rupture soaking the flares which in turn ignite and then ignite the gas which sets of a chain reaction that would in turn reduce the ship to a burned out mass of girders, killing many of the crew in the process. I have a problem with this theory, this part of the ship, where the flares were in the control car was quite a distance from the gas, above the control car you had 2 passenger levels, 2 manned gas free areas above the control car.even if the flares ignited they wouldn't have been in close contact with the gas as they were 2 floors below and outside the ship in the gondola. There were far more possible sources of ignition of the gas, when the front of the envelope of the ship developed the tear at the beginning of the accident and the gas cells at the front started deflating that created a large in ship gas air mix, hydrogen when pure will not burn but when mixed with air becomes highly flammable, so as the ship impacted with the ground this high gas air mix would be right where the impact occurred, at the nose, lots of structure collapsing, possibility of live electrical circuits and forward engines running being pushed into the hull, these are fire sources that are far more likely to be the cause over the flares. It is not to say the flares did not ignite, in fact a survivor testimony stated there was a strange white glow coming from the control car after the impact occurred, but as someone actually witnessed the white flare like light also leans me into thinking that it wasn't the cause of the main fire.